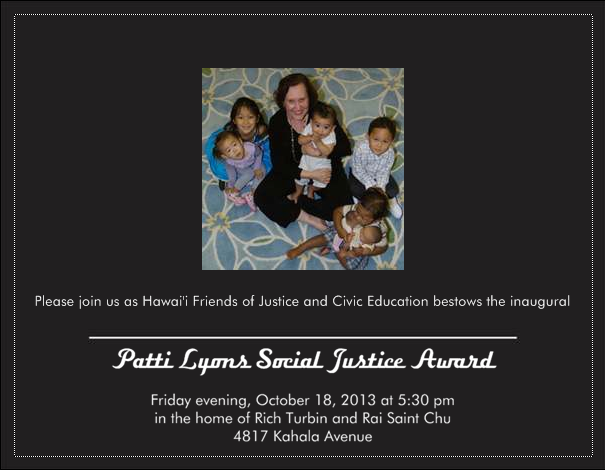 on Friday, October 18, 2013 at 5:30 p.m. at 4817 Kahala Avenue. Patti Lyons has been committed to improving the lives of the most vulnerable children since graduating from Indiana University with a Masters in Social Work in 1961. Her lifetime service began as a Child Welfare Consultant with the Indiana State Department of Public Welfare, where she worked tirelessly to establish child welfare services where there was none. After moving to Hawai‘i, her advocacy efforts led to the establishment of the Child Protective Service Center under the Department of Human Services in 1968. She opened the first Child and Family Service (CFS) satellite outreach office in Wai‘anae and eventually became the CFS President and CEO in 1980. Her association with the Philippines began in 1987 while evaluating an adoption program for Filipino children operated by CFS and later that year establishing a shelter for street children in Baguio City, Philippines. In 1990, Patti left CFS after 23 years to become the first President and CEO of Consuelo Zobel Alger Foundation at the request of its founder and benefactress. As the head of this foundation, she managed both the headquarters in Hawai‘i and its Philippine branch in Manila. Today, she serves as Historian and Secretary of the Board of Directors. Patti currently volunteers at the Hawai’i women’s prison counseling women imprisoned for child abuse and assists their families. Please join us! Attendance requires a $150.00 registration per person. However, your donation of any amount is greatly appreciated by check or paypal. OR USE PAYPAL to register online with a $150.00 payment by clicking on the “Make a Donation” button below . . . MAHALO! 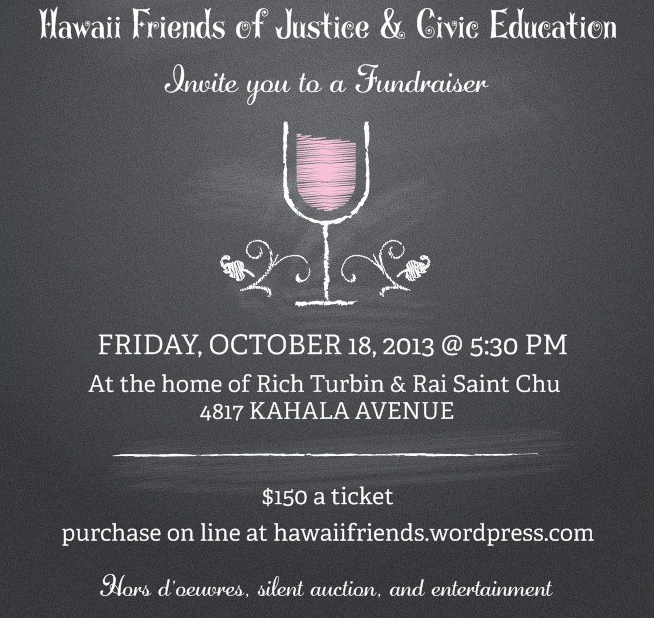 Hawai‘i Friends of Justice & Civic Education is a nonprofit agency run entirely by volunteers. Since 1996 Hawai‘i Friends has created numerous restorative justice programs. Our restorative justice programs provide youth with learning situations where they take accountability and make plans for their future. Dealing with emotional wounds may be a vital factor for desistance from crime for the future behavior of the juvenile. 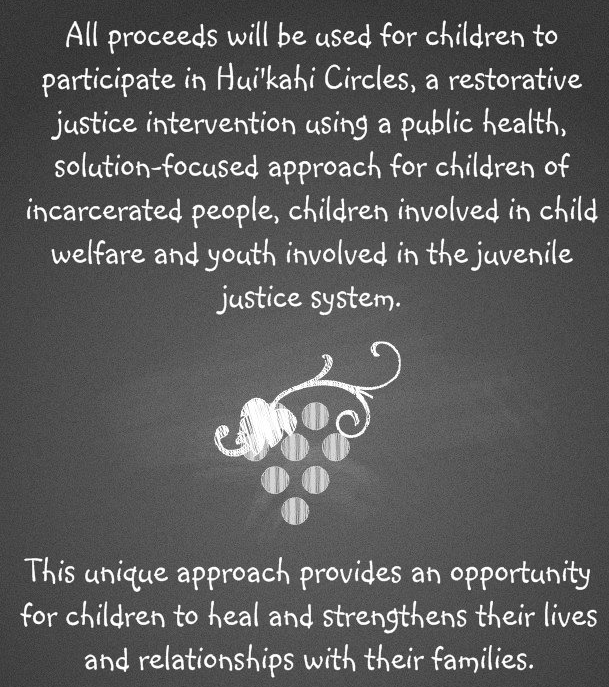 All ticket proceeds will be used for children to participate in Restorative Justice Solution Focused Circles. Hawaii Friends of Justice is a 501(c)3 organization. Donations are tax deductible and letters of confirmation will be issued for each gift. Mahalo nui loa.